These were fantastic. Omg, did I love these.. as did my friends and The Baron. It's luscious, chocolatey, not too sweet and just enough booze to keep you happy for a little Irish jig! To make these gluten free, Guinness needs to be omitted (it contains gluten) so use water instead. Then of course, use gluten free flour and follow the rest of the recipe. Make the filling: Chop the chocolate and transfer it to a heatproof bowl. Heat the cream until almost scalding and pour it over the chocolate. Let it sit for one minute and then stir until smooth. Add the butter and whiskey (if you’re using it) and stir until combined. When the frosting looks thick enough to spread, drizzle in the Baileys (or cream) and whip it until combined. If this has made the frosting too thin, beat in another spoonful or two of powdered sugar. 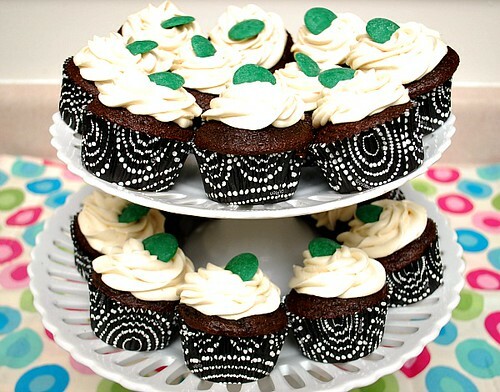 Ice and decorate the cupcakes as desired. I topped it with a green chocolate melting dish as garnish. 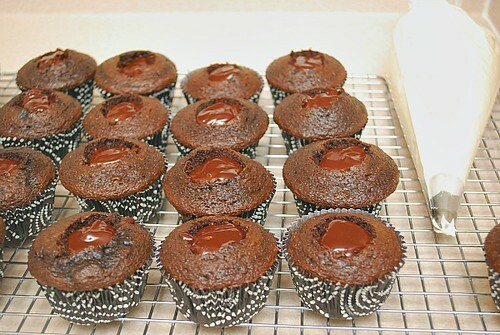 Do ahead: You can bake the cupcakes a week or two in advance and store them, well wrapped, in the freezer. You can also fill them before you freeze them. They also keep filled — or filled and frosted — in the fridge for a day. 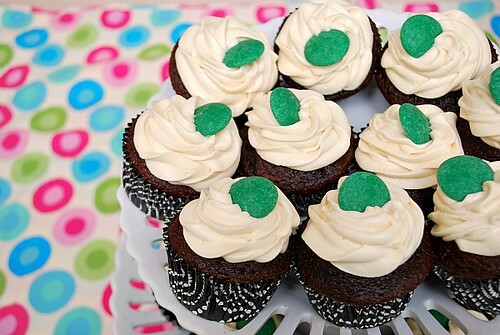 Fabulous St. Patrick's Day Treat!